Today Greens member for Newtown Jenny Leong will give notice of a bill to end the use of drug detection dogs without a warrant on public transport, at festivals, bars and Kings Cross. The Law Enforcement (Powers and Responsibilities) Amendment (Sniffer Dogs—Repeal of Powers) Bill 2015 aims to repeal parts of the Law Enforcement Powers and Responsibilities Act 2002 relating to the use of drug detection dogs. 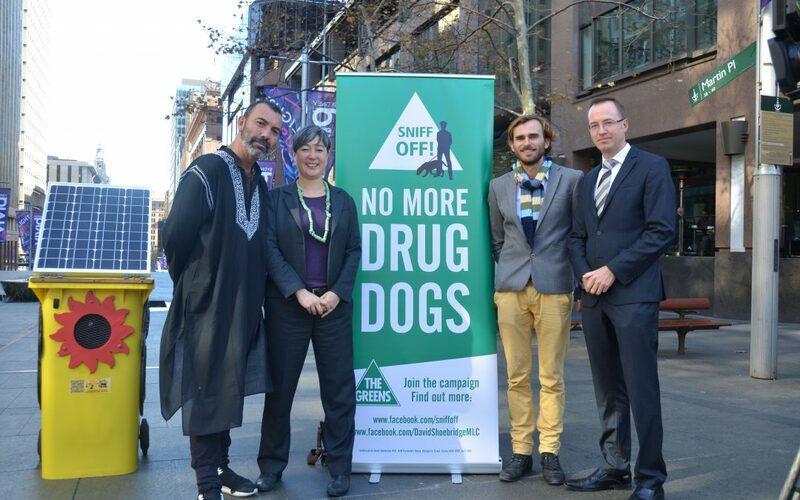 The Bill is the latest part of the Greens NSW “Sniff Off” campaign against the use of drug dogs. You can find more information (including statistics) here. The campaign is supported by musicians and performers including Paul Mac and Dan McNamee from Arts V Science who aim to protect their audiences from over-policing. A Sniff Off Party will be held on Saturday 30 May at the Red Rattler in Marrickville, featuring Paul Mac and other artists. “The evidence is in: the drug dogs program doesn’t work. The NSW police have better things to do than wrongly humiliating thousands of mainly young and marginalised people. “If you are at Redfern Station, you are 6.5 times more likely to be searched than at Central Station. “But Redfern has the highest false-positive rate of any Local Area Command. This isn’t evidence-based policing. So what’s it about? “Drug policy and policing needs to be evidence-based and focussed on protecting the needs of the community. This means a harm minimisation approach to drugs, not abusing people’s rights,” Ms Leong said. “When a police drug dog indicates somebody possesses drugs, the fact is they are getting it wrong between two thirds and three quarters of the time. “Despite drug dogs being wrong most of the time, thousands of people on public transport, at bars and festivals are subjected to humiliating public searches each year. “Even when police do find drugs, it is usually a small amount for personal consumption. Only 2% of searches result in a supply conviction. “The drug dog regime does not target high-level drug dealers or suppliers. It targets young people, the poor and Aboriginal communities,” Mr Shoebridge said. “I think the use of sniffer dogs is an invasion of personal liberties. Nobody should be expected to undergo a strip search in order to enter a dance party or a music festival. “Sniffer dogs are an aggressive way for the police force to talk to the public about drug use, of any kind. “So many police resources are wasted enforcing this policy which could be spent out on the street preventing violent crimes,” Paul Mac said.